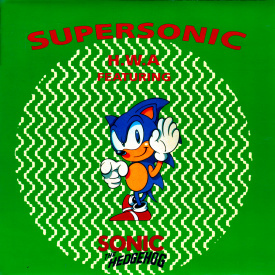 Vocals: H.W.A., "Sonic the Hedgehog"
This article is about the 1992 UK music single. For the "Super" version of Sonic, see Super Sonic. SUPERSONIC is a maxi-single released in 1992 by Internal Affairs, a subsidiary of Zomba Records which was owned by Sony Records. The single is credited to "H.W.A. (Hedgehog With Attitude) featuring Sonic the Hedgehog," and is the first music release connected to the Sonic franchise. The track was released on vinyl, cassette and CD formats, also making this one of the few Sonic-related music offerings to be playable on a turntable. All proceeds from the single were donated to the Nordoff-Robbins Music Therapy Centre. Though the vinyl/cassette and CD track listing varies slightly, every cut is based around the Green Hill Zone song composed by DREAMS COME TRUE front man Masato Nakamura, with Wayne Brown doing arrangements. Recorded at Battery Studios, London. An original sound recording made by Zomba Records Ltd. Note: As no official lyrics were printed with the single, this transcription is an approximation based on what can be heard. There may be errors, and as such should not be taken as completely accurate. In the credits, two names are listed as the composers: Wayne Brown and "Writer Unknown." As the single is based on the background music to Green Hill Zone, the name that should be on the label is Masato Nakamura, who composed the music to the original Sonic the Hedgehog and its sequel. This page was last edited on 22 May 2018, at 10:11.